Gorilla Trekking is among the most thrilling safari activities enjoyed by travelers that come to Africa to watch the primates. All primates in Africa can be watched on an extra ordinary safari activity that has the element of trekking. It is among the reasons why its called tracking due to the fact that it encompasses traversing the tough terrains in the tropical landscape when booking for Rwanda & Tanzania Safari. A gorilla trek can be done in Uganda, Rwanda & Democratic Republic of Congo. Gorilla trekking includes visiting the mountain gorillas, Lowland gorillas & other primates like golden monkey, chimpanzee tracking and many more. All these safari activities can be enjoyed through one stop safari vacation in Africa with primate Safaris Rwanda. Mountain Gorilla Trekking can be done in Volcanoes National Park, Bwindi Impenetrable Forest, Mgahinga National Park and Virunga National park. Yet eastern lowland gorillas can be visited in Kahuzi biega national park in democratic republic of congo. All Destinations and places listed above are the highlight of all visits done in Uganda, Rwanda & Congo and certainly mountain gorillas are the major reason as to why very many people visit East Africa & watching the big five animals. For a gorilla trekking in Africa you need to be fairly fit to visit the mountain gorillas & lowland gorillas, equipped for the humid, muddy conditions of a rain forest hike as it rains any time in the jungle due to the fact that it receives tropical rains. The gorillas are susceptible to human illnesses so you should be aware of that when visiting the gorillas in the wild and you won’t be permitted to trek if you are unwell. Even in the dry season, the rain forest is a challenging environment: it’s humid, wet and muddy with some steep slopes, plenty of insects and thick vegetation. It is absolutely worth the effort to spend time with Mountain & lowland gorillas in the wild. A Gorilla Permit is a document that permits you to be allowed to go for gorilla trekking in the reserved national park. Gorilla permits differs in looking which originate from the issuing body, for Uganda now its a card, Rwanda its a document and Congo at the moment its just invoice from the park headquarters and its a documents too . 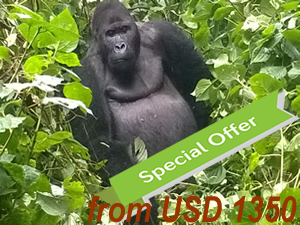 The costs differs from which country you have selected to visit for gorilla trekking and if booking gorilla trekking safari , just take note that the cost offered to you is inclusive of the permit fees. Rwanda gorilla permit costs USD 750 to visit Volcanoes national park . Uganda gorilla permit costs USD 600 during peak season and 450 USD during low season. Congo Mountain & lowland gorilla permit costs USD 400. Whats the Validity of the Gorilla permit. All Gorilla permits are valid for one trekking and if your interested in double gorilla trekking you should secure two permits depending on the destinations your visiting. Once a gorilla permit is reserved and confirmed by payment its alternative in the trekking days will attach an extra charge.